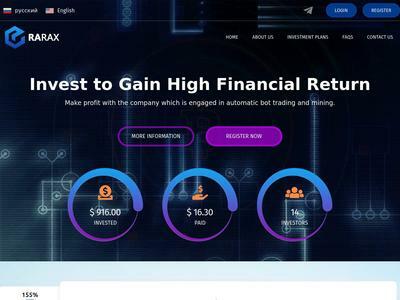 EraRax gains its income on crypto-currency Auto trading and mining. The company was established practically simultaneously with the appearance of the notion of crypto-currency as we saw its enormous potential and won in the long run. Since our company saw the beginning of the sphere development, our main income is raised from the bot trading and mining of such crypto-currencies as Bitcoin and Litecoin, which is beyond reach for the majority of companies. Investment Plan: 155% After 1 Day, 420% After 4 Days, 1280% After 12 Days, 5800% After 31 Day.